Last June, Stephen Lendman published an article covering Walter "John" Williams's views on Future US Hyperinflation . These views are more relevant than ever today. Walter “John” Williams thinks out of the box. He makes disquieting reading, but you won't find him in the mainstream. Conditions today are hazardous. A major financial crisis precipitated them. Reckless policies caused it. It threatens the solvency of major banks and other financial institutions. It also hurts the greater economy. Solutions - massive liquidity injections, interest rate cuts and reckless deficit spending. Result - financial malpractice for a short-term fix. Consequences - “financial Armageddon” according to Williams. 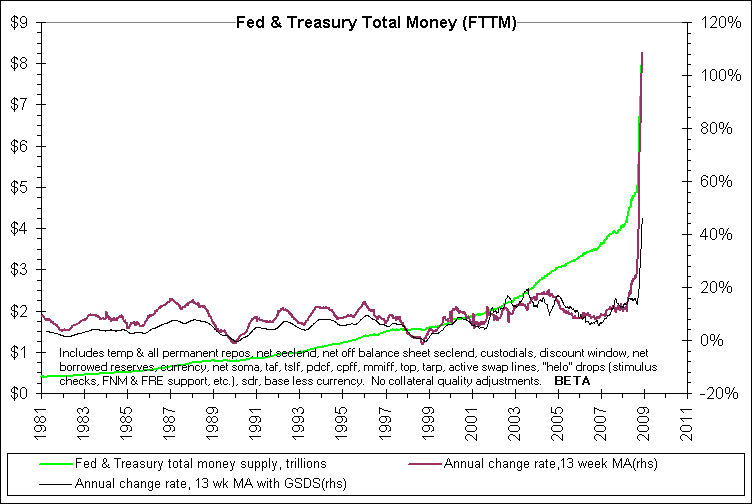 M3 (the broadest money supply measure) growth is so high that the Fed no longer reports it. Economists like Williams do because it's crucial to know, and the data he reveals are disturbing - record M3 growth at a near 18% annual pace. Hyperinflationary seeds are now sown. Dollar valuation is falling, and at some point may accelerate when investors flee it for safer havens. The Fed again will respond. More debt will be monetized. It will build over time. Things will get worse and then be exacerbated when the government is less able to meet its obligations. “Therein lies the ultimate basis for the pending hyperinflation,” in Williams' judgment. He believes it will morph into a hyperinflationary depression, then a “great depression.” And when it hits, it will be with “surprising speed.” Already disposable income is falling in a weakened economy in crisis. As things worsen, politicians get blamed, and Williams raises an interesting possibility. If conditions get bad enough, voters may respond with their feet, declare a pox on both major parties, and turn to a third alternative around 2010 or 2012. It happened before in our history. The Republican Party is Exhibit A. It was created in 1854 at a time Democrats and Whigs were the two dominant parties. Exit Whigs, and enter Republicans with Abraham Lincoln its first elected president in 1860. Williams shows US inflation data going back to 1665. It was fairly stable up to the Fed's 1913 creation. It then began rising and accelerated post-WW II. Government calculations mask it. Alternative ones are more revealing and accurate. Except for minor price declines in 1944 and 1955, the US hasn't had a deflationary period since the 1930s. Abandoning the gold standard is why. It imposed monetary discipline. Roosevelt went off it in 1933. He had to. The banking system collapsed, money supply imploded, and economic stimulus was needed. It released the Fed to create money freely. Therein lies the problem, and it shows up in the numbers. So it has, according to Williams, and it caused a “slow-motion destruction of the US dollar's purchasing power” since 1933. It shows up in GAAP-based 2007 federal deficit figures - $4 trillion for the fiscal year, not the official $163 fiction reported. Williams estimates total outstanding federal obligations at $62.6 trillion. At least one other economist puts it over $80 trillion. There's no way to honor this debt level, so the “government effectively is bankrupt.” At that point, it has three choices - default, declare a moratorium, or repudiate the entire amount. Sooner or later, markets will react. Holders of US debt already are balking, but so far modestly and quietly. Ahead, that may change if dollar valuations plunge. It will force the Fed's hand. Greater debt monetization will follow. Dollar valuations will sink further, and so forth in a progressive downward cycle to oblivion if Williams is right. If conditions get severe enough, the Fed can create huge amounts of currency in a few days or weeks - enough to match the dollar's lost purchasing power in the last 75 years. Combine it with fiscal irresponsibility and imagine the consequences. In 1980, its price hit $850 an ounce. In CPI inflation-adjusted terms, around $2300 an ounce would match it today. But if the government hadn't cooked the CPI calculation, the number would be about $6250 an ounce. By that standard, gold today is cheap. It's way below its real 1980 top, and if inflation accelerates as Williams predicts, expect much higher prices as dollars keep deflating. Under this scenario, the “US government cannot cover (its) existing obligations.” Annual federal deficits are “careening wildly out of control, averaging $4.6 trillion per year for the six years through 2007.” That's with all unfunded liabilities included like Social Security, Medicare, Medicaid, other social services, debt service and more. Williams says things are so out of control that “if the government (raised taxes) to seize 100% of all wages, salaries and corporate profits, it still would (show) an annual deficit using GAAP accounting” methods. At the same time, “given current revenues, if it stopped (all) spending (including defense and homeland security) other than Social Security and Medicare obligations, the government still would (show) an annual deficit.” The hole is so deep, it's impossible to dig out, according to Williams. But given political realities, officials spend whatever it takes to get elected and keep their jobs. That's besides foreign wars, limitless corporate subsidies and more. Things, however, won't improve. They'll worsen, and that for Williams spells hyperinflation ahead. It's happening “with the full knowledge of political Washington and the Federal Reserve.” It it weren't for the US's “special position,” our debt would likely be rated “below investment grade instead of triple-A.” Longer term bonds are especially risky. At some point, they'll lose their full value. They also risk default, and that's besides their loss in dollar terms. It's just a matter of time before foreign investors get worried enough to act - buying fewer Treasuries down to none, then followed by redemptions. The Fed will have to compensate. Print more currency, and the problem deepens. Its value declines and inflation accelerates. Given the federal deficit and out-of-control spending, fiscal policy limits have been reached. The Fed's in the same bind. It can neither stimulate the economy or contain inflation. Rate cuts have done little. Saving the dollar may require raising them, but that won't “contain non-demand driven inflation.” It shows up in high food, energy, health care, and companies like Dow Chemical announcing on May 28 that it will raise prices across the board up to 20% to offset increased costs. Federal bailouts have worsened things. Dollar creation exploded. Crisis has been pushed into the future. Its enormity will be far greater, and foreign investors will get stuck with a lot of it. When it arrives in strength, capital outflow will follow, and dollar valuation will plunge with it. Williams believes that “both central bank and major private investors know that the dollar is going to be a losing proposition. They either expect and/or hope that they can get of (it) in time to lock in their profits (or for central bankers) that they can forestall the ultimate global economic crisis” as long as possible. Dollars are very vulnerable in this environment. 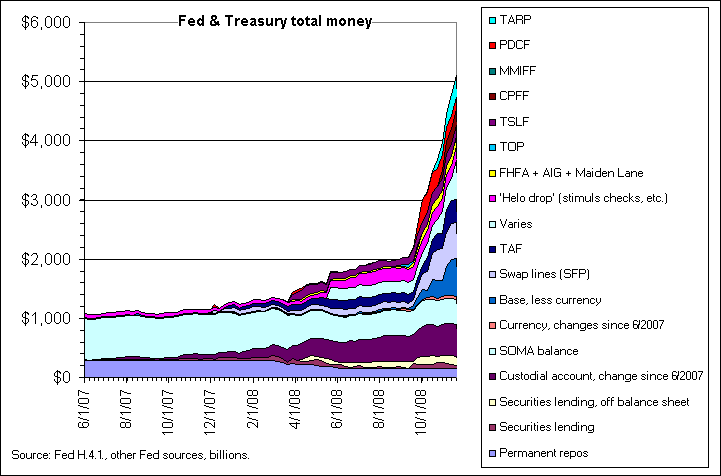 If Treasuries are dumped, the Fed will monetize debt to make up the difference. Inflation will then accelerate, multi-trillion dollar deficits will worsen things, and a “self-feeding cycle of currency debasement and hyperinflation” will follow. Cash as we know it will disappear. A barter system and black market will replace it or possible introduction of a new currency. Since most money today is electronic, not physical, chances of it adapting “are practically nil.” With hyperinflation, electronic commerce would completely shut down and economic collapse would follow. Gold and silver will be invaluable. Holders could exchange them for goods and services. Physical goods will also be precious for survival and as a medium of exchange. Anything with a long shelf life may be stocked in advance, and providers of essential services could barter them for goods and other services. Forewarned is forearmed. Safety and liquidity are crucial. Anything retaining value is essential. Real estate, other currencies for example. Foreign equities and debt to a small degree because US financial assets hammering will spill everywhere. With all that to deal with, consider another dilemma - the likelihood of painful political change, civil unrest, disruptive violence, and utter chaos. If Williams is right and hyperinflation arrives, Katie bar the door on what may follow. Revolutions are possible with three notable last century ones to consider - in Russia, Weimer Germany and Nationalist China. In each case, the old order ended, everything changed, but not for the good. How does Williams advise? Evaluate one's own circumstances, use common sense, and forewarned is forearmed. That will help, but hard times hurt everyone. My reaction: Like Walter "John" Williams, I believe hyperinflation is imminent for the US. The current deflationary phase is ending. Our enormous trade deficits and reckless money creation guarantee that the next phase will be hyperinflation, and the trigger will be rising gold prices. 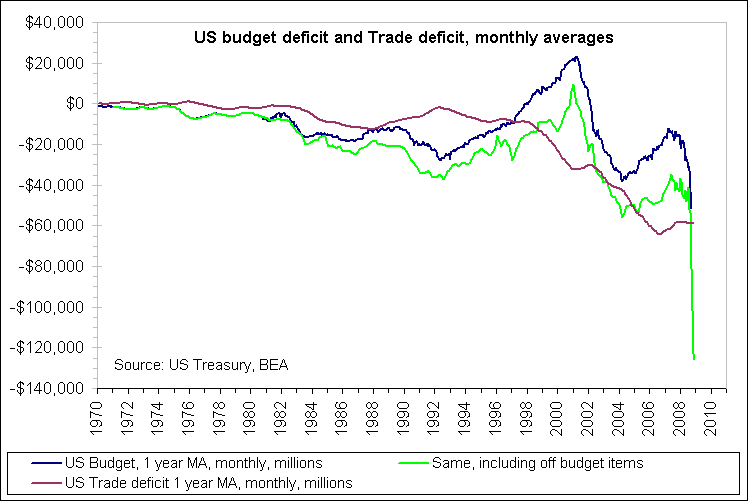 To put the US's international deficits into context, Here is an extract from an article by Alan Tonelson where he writes that the U.S. Trade Deficit Endangers the American Economy . Measuring the deficit as a share of the whole economy is critical because it indicates how sustainable America's foreign debts are. Last fall, the Federal Reserve published a study showing that most countries run into major financial trouble when their overall international deficits hit four percent of gross domestic product. In other words, these countries' foreign creditors begin fearing that their debts have become so high that full repayment is no longer possible. And the creditors become much less willing to continue lending. Sometimes they cut off the credit supply altogether, and even start selling the assets they hold in the debtor country, including their stockpiles of its currency. And other creditors tend to follow suit. If you're curious about how this rush for the doors can end, take a look at the economic devastation in Argentina. After hitting a record 6.6 percent of GDP, U.S. trade and current account deficits now stands around 5 percent of GDP, but it is about to turn significantly higher. US GDP is enormously dependent on consumer spending which is disappear due to collapsing consumer credit. Meanwhile, the US imports aren't likely to drop much as they are goods Americans can least afford to give up: cheap non-durable goods, oil, etc. Finally, exports are likely to fall rapidly because what little manufacturing the US has left is concentrated in durable goods, the sector most sensitive to economic slowdowns (also sector hit hardest during the great depression). So while the US's GDP and exports are going to shrink enormously, our reliance on imports won't shrink much at all. In fact, when the dollar's collapse pushes oil back over a $100 a barrel, the US trade and current account deficits will easily surpass 10%. The terminal decline in US trade relations is visually depicted in the chart below from nowandfutures.com . A break out in gold prices over $1000 will be the opening act of the depression's hyperinflationary phase. Already, precious metals are experiencing widespread physical shortages, and last week gold went into backwardation for three days. However, it is developments on the COMEX which will act as a catalyst to sent gold higher. Rising counterparty fears have caused open interest in gold futures to plummet from an all-time high of 593,000 in January to an astounding 276000 as of Friday. Investors want physical gold and aren't willing to settle for paper promises, which is why 8600 December contracts issued notices for delivery yesterday. If there are no default (big if), these deliveries will wipe out 31% of the COMEX's registered gold , sending prices soaring. The end result should not be confusing to anyone. In simplified terms, the US is a country heavily dependent on foreign imports, yet produces little the world really needs and owes an unplayably large amount of debt. A hyperinflationary depressionis the only possible outcome.